Our team at 24×7 Solutions is based around Australia. 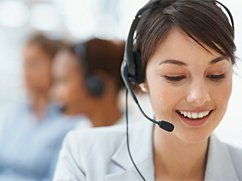 We have our consultants set up with desk-phones, headsets, and computers with three monitors, speakers as well as laptops and mobiles as a contingency. All our staffs are senior level consultants. The average experience of the team is 19yrs, highly experience and very confident staff. Mena began working with 24×7 Solutions in March 2009 and brings a solid understanding of the emergency after hour’s service. Mena has been in the travel industry for over 27 years. Her experience covers retail, wholesale and for the last 17 years she has been in Corporate Travel. She was with FCM Corporate for over 8 years, starting as a full time corporate consultant on the NAB/MLC account. She was then moved onto FCM after hours team after until the company underwent a restructure. She has come away with a wealth of experience. As an FCM after hour’s consultant they handled 3000 calls per month with 350 different accounts. Accounts ranged from large to small with all having their own travel policies. As well as this Mena has a very positive attitude this is perfect for After Hours and Emergency situations. She also is very proficient with the 3 GDS’s Amadeus, Galileo and Sabre. She has a solid knowledge of International and Domestic destinations and having worked at FCM Corporate she is fully conversant on APOSD’s, Private and Nett fares and all Domestic fares. Mena has a high level of Customer service and is a great problem solver. In Feb 2011 Mena moved from consultant in the afterhours team to Operations Manager. She implemented changes for a better cohesive production, developed Client relationships, implemented structure internally and externally, streamlining 24×7 solutions for a better more productive service. By November 2011 Mena was offered the General Manager and has thrived , building the business up to now threefold and constantly working on better ways to achieve the best results. Mena has a great relationship not only with the staff but across management and clients, with a can do attitude. Monica is well travelled individual with a wealth of experience. She has over 20yrs experience in the industry both in Retail and Corporate travel. Customer-service driven professional who has regularly demonstrated the skills and experience needed to meet the demands and requirements of working within performance-driven sales environment. Monica is able to remain calm and focused during times of pressure whilst maintaining an innovative and creative approach. She has earned a reputation as someone who is punctual, dependable and is an active team player. Jill has been in the travel industry for 15yrs. Working in retail, and Corporate. Jill has won various awards in throughout her career. Her strength is customer service, Jill has great ability to relate to people very quickly in order to assist them quickly and efficiently. Her knowledge expands to using all 3 GDS’ Amadeus, Sabre and Galileo as well as supporting Tramada and SAM along with various others. Highly regarded by her peers and loved by clients, Jill is a huge asset to the team. Annabel is one of our youngest members of the team with 8yrs of experience, mainly within the corporate travel sector. She has worked with large companies and handled multi-million dollar accounts, as well as looked after high level VIPs and executives. She has a lot of experience in dealing with stressful emergency situations such as natural disasters and ash clouds. Her patience and precise nature has been a huge facilitator in been able to excel at everything she does in her career. She thoroughly loves the Corporate travel industry and joining the afterhours team has been the perfect fit for someone who thrives on a challenge and enjoys problem solving. Annabel is a very precise consultant who always makes sure every detail is correctly in place. Annabel is very reliable and focused and has thrived at all challenges presented to her in the afterhours role. Leigh has been in the travel industry for 14years both in retail and corporate. Her experience has given her extensive knowledge in all areas of the industry, handling high profile multi-million dollar accounts. Leigh also worked as Team Leader her wealth of knowledge permits her to be very concise with details and the ability to be able to think outside the box. She is a senior level consultant. Very thorough and loves the challenges the after-hours emergency assist role gives her, reliable and genuine with a professional attitude. She has excellent knowledge in fares and ticketing, and is versed in regards to travel procedures and regulations set by the clients. Leigh fits perfectly into our team of experts. Alex has 11+ years’ experience in travel across consolidation and in the TMC space where he was responsible for high end corporate accounts. Alex’s is a real asset to the team with comprehensive fares knowledge, having worked in the past for a consolidator. He has helped retail agents and airline representatives advise on fare routings, complicated fare constructions, issues, reissues, fare rulings and more. This knowledge and experience allows Alex to work on complicated situations with speed, professionalism and strive to find the best outcome for the client. 24×7 are lucky to have someone with extensive fares knowledge as part of our professional team. Lyndsey has had extensive experience working as an afterhours consultant. She is loyal, thoughtful and professional – very thorough and is a really great consultant. Thorough knowledge of systems, has a good approach to problem solving and takes problems with ease. Accustomed to working autonomously, she is also a great team player with experience to meet high pressure and demanding situations. She loves the corporate industry and more importantly thrives on working in an afterhours highly demanding positions, this is where Lyndsey shines. Great asset to the team, our clients are in good hands.